TB-500, or Thymosin Beta 4, is a peptide that naturally occurs in the human body and in animal bodies, and, since it is mostly sold for research purposes and veterinary use, is typically implemented in clinical trials in horses. As you learned in the previous article on BPC-157, peptides are two or more amino acids linked together in a chain, and TB-500 is a simply a short peptide fragment of an actual hormone – a hormone called “Thymosin Beta-4”. You can find TB-500 (often sold under the name Thymosin Beta 4) on several peptide supplier websites. These websites can only legally sell the peptides for research purposes. Take the lids off both your bacteriostatic water and TB-500 containers. Rub the alcohol swab along the rubber stopper on the TB-500 container, and the top of the bacteriostatic water vial and allow each to air dry. Fill the insulin syringe with bacteriostatic water and slowly and carefully inject the syringe of water into the 5mg bottle of TB-500 – being careful to spray the water onto the sides of the container rather than directly into the powder. If you do this three times, you will nearly fill the 5mg bottle of TB-500. Your TB-500 is now reconstituted. You will want to keep it in the refrigerator or freezer to preserve it until you’re ready to use it. Do not let your mixed TB-500 sit at room temperature or in the light or it will go bad. To ensure the highest quality, it needs to be kept out of direct light and at refrigerated or frozen temperatures. When drawing TB-500 into syringes for injection, turn the bottle upside down slowly and draw the liquid into the syringe smoothly and slowly. When injecting, do so with a smooth, slow motion as well. Peptides are fragile and too much mixing and jostling of the container can damage or reduce the effectiveness of your product. TB-500 can be delivered through subcutaneous, intramuscular, or intravenous injections. Before using any of these methods, use a fresh alcohol swab to clean the rubber stopper of your TB-500 bottle and the area of injection. This will minimize your risks for bacteria and contamination. Subcutaneous injections – you simply pinch an area of skin and push the needle through it. Tip: you should inject an area of your body near your actual injury. 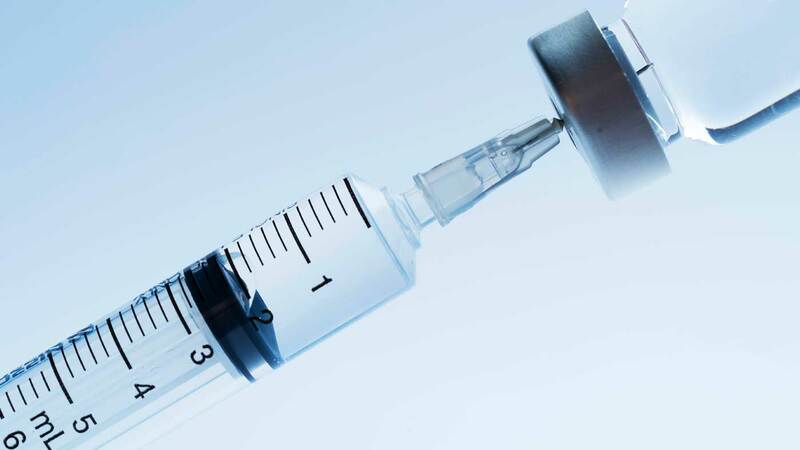 Intramuscular injections – these are harder than subcutaneous injections as instead of simply inserting the needle under the skin, the needle must be “stabbed” into the muscle as close to the area you are experiencing pain or injury as possible. Intravenous injection – the needle is inserted directly into the vein, usually on the wrist, elbow, or back of the hand. This one is pretty tough, and I don’t recommend unless you have medical supervision or really know what you’re doing. After injecting TB-500, massage the area of injection for about a minute to help work the TB-500 into the tissues and improve the absorption and effectiveness. The most common dose of TB-500/Thymosin Beta 4 is based on your body weight. For a 200-pound person, the dosage recommendation is about 7.66mg per week for six weeks. This is derived by calculating the human dose based on the recommended dosage of TB-500 for greyhounds (5 mg) according to MediVet (the TB-500 manufacturer). At the risk of sending you down a broscience rabbit hole, here’s a link to a bodybuilding forum discussion that delves into TB-500 dosage in more detail, along with some practical user experiences. You should know that there have been some conflicting research studies about this stuff when it comes to cancer. Some studies suggest that it may contribute to the growth of existing cancer cells, while further data suggests it may inhibit cancer. Here’s the deal: peptides are the wild, wild west of supplementation. Many are illegal for sanctioned sporting purposes, so do your research (I recommend GlobalDro.com for this). Many do not have long term safety studies in humans, but decent track records in animals. But when it comes to healing injuries fast, healing the gut, growing new muscle faster, or getting any of the other benefits I mentioned in this article, it may be worth looking into peptides such as TB-500 or BPC-157. Do you have questions or comments about TB-500? Have you used it yourself? Let me know in the comments below. I’d love to hear about your experience, and any tips you have for peptide use. I’ve been on it for a month. 5mg/week, 2 2.5mg injections. Not only has it not done a thing for me but I feel worse. Dizziness, headaches. None of the stuff I’m using it for has seen any marked improvement. We are looking into that as an alternative if the compounding pharmacy our doctor mentioned is too expensive. We are ordering some thymosin beta 4 from a compounding pharmacy (tailormadecompounding.com). Our physician wrote a prescription for both the beta 4 and the thymosin alpha 1. It will be rather expensive – shipped in insulated cold pack containers and pre-constituted. I will post the cost as soon as we see what it is. I will ask them about longevity – doctor says it can last for months in the fridge. They did also say if you freeze it use soon and don’t refreeze it ever again. Will also repost after we see effects on healing for herniated disc and other things, as well as hair growth. The pharmacy called (tailormadecompounding.com) and said that they do send the bottles of liquid with the alpha 1 or the tb 500 (we are getting both) ready to use. The bottles are shipped in cold packs. They say the water is sterile with a buffer of some sort. They say it will last refrigerated for a couple of months at least and have tested it to see that it does. They ship it to a lab in Utah to be tested, so it endures the shipping rather well, apparently. They also were shipping 31 gauge syringes, which seem better than using the thicker 28 gauge. However, the real issue for us would be the cost – they want over $900.00 for a months supply of these two peptides (alpha 1 and beta 4), along with the syringes. This is ridiculously overpriced. Granted, it is made here in the US and is human grade and guaranteed to be at least 99% pure. Still, it just seems like the profit markup on this would be like 3000%… which is obnoxious. BTW – the month’s supply of these two peptides included doses of 750 mcg/day each. Recovering from my 3rd ACL reconstruction surgery in the last 3 years, thinking of going the route of Tb 500 and Bpc 157. knee is healing slower the third time around and thinking this may be the right solution to heal right this time. Only 21 years old also by the way. Where do you recommend buying TB-500 from online? I’m looking too, thinking Peptide Sciences but I see mixed reviews. Any luck for you? Could this be helpful for myofascial pain syndrome? Or help break up knots? Ben! Please let me know your thoughts on TB500 for dry eyes my man. I have symptomatic dry eyes and doctors have NO idea how to treat it. I’ve read some study’s saying that TB-500 may be the next best thing for dry eye treatment. Would I need to put TB500 into an eye drop? Or injection is still fine? It works great! LASIK surgery caused my eyes to be majorly dry for going on half a year now. It’s amazing how well it works. It should recommended for people post surgery. Hey man do you know if this is bioavailable or able to be taken orally? I am planning on injecting BPC and TB500 subcutaneously but my girlfriend does my injections so I was thinking of taking it orally on off days. Am I missing something here. The Reconstitution Calculator doesn’t go that high. (mg converted down to mcg?) Basically I am trying to figure out how many Viles of TB-500 5mg I would need after reconstituted as per above info. I’m looking to do 6.5mg weekly dose for 6 weeks. I’ve done this exact protocol exactly like this over a 21 day period in September. I did this while doing a series of PRP treatments to supplement that process. I can vouch for this actually helping grow some hair. I mean if you are bald and expecting hair growth, don’t get too excited – but if you are thinning or something, it definitely contributed to helping grow hair and seems to have continued to do so. Overall I think it would be a good thing to try out if you can. Mike – how many ml per day did you use for 21 day protocol? Our doctor has prescribed the Thymosin Alpha 1 for immune system support. 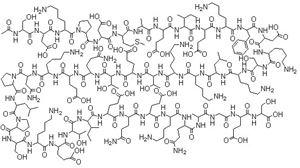 Another peptide. I would love to try TB-500 for my research but am a bit unsure where to get it. I have studied various SARMS from sarmswearhouse.com with excellent results but it looks like they do not supply TB-500. Would you mind pointing me to a reliable source for it ? If you put 1 cc of water in a 2mg vial. You have 1cc with a 2mg concentration in that cc. If you take 1/2 a cc you are only taking 1mg. If you do that 3 times a week…. You get the math. Thanks for all of the info on your great website. Question for you regarding TB500. I think you mentioned how delicate it is when handling it and mixing it with water. I am thinking about buying a bulk order via alibaba.com and wondering if it would be feasible to put the powder into 5mg mixing vials myself. Any risks in doing so? Yep, you can do that so long as you follow my reconstitution instructions in article. How did you like the tb500 from alibaba.com? An insulin syringe is by definition a 1 cc syringe with a subQ needle. Therefore to get 3cc’s you would have to fill it 3X. Don’t confuse cc’s with mg. Cc’s are the amount of fluid to carry the medication. The medication itself is measured in mg.
i’m currently taking Mod GRF 1-29 and Ipamorelin; can I add BP-500 to this stack? I always recommend people speak with their doctor about any medications/supplements they plan to take together. I’m curious if you’ve come across anyone that has success with speeding up the healing process with golfers elbow? Jaime, where did you get your Ipamorelin and Mod grf 1-29? Jamie I’m also currently taking Ipam and Mod GRF 1-29 … I’ve been taking for 7 weeks. Haven’t really noticed any benefit yet, unfortunately. How bout you? Trying to decide what is best for nerve damage due to Cipro poisoning.. brain issues, cranial nerves, nerves down right limbs, and gut was affected as well.. Am a highly sensitive and delicate female.. lol. Recently read about BPC-157 patches?? Maybe this would be the gentlest to try? Which might be good to start with at low dose.. BPC or TB 500? Is there any where else you recommend getting peptides from? My communications with nord-sci haven’t been the most professional and they also no longer take cards. Have you used tb500 from them? What would be the best 3 or 4 sarms/peptides for healing injuries? Tb500 bpc157…not to be rude but did you read the article? I also have ehlers danlos and am trying it for the same reasons! For collagen i recomand adequan, google ut. If I wanted to use tb500 now for athletic performance and muscle recovery, how long would it take to get out of my system if I decided to compete in a WADA sanctioned sport? Yes, you can stack the two. do you think its ok to constitute with sterile water instead of BAC water? Im in a pinch and don’t have BAC water at the moment. No dont. Go to the drug store/pharmacy and ask for some. Do not use regular water. Unfortunately, after about 20 days TB-500 I have developed a type II Allegie. is not suitable for everyone. I tolerate BPC-157 without problems. Hi Ben. I’ve been taking metformin for life extension. Would there be any interaction if I took theTB 500 with Metformin? I'm not a doctor so I can't say for sure. I would speak with your doctor about this. Can you take tb500 daily the same way as bpc 157 as your ratios of reconstitution are the same? I personally wouldn’t. Although the reconstitution is the same – the protocol is not. How in the world can I Pay on Nord-Sci? Credit cards won’t work. Not sure what an Amazon e-code is, but that option doesn’t seem to work either. hi what is your experience with it ? Hi Trevor, I can't really advise on prodcuts I haven't tried and am not familiar with, especially when it involves mixing and injecting these things into one's body. I would contact that company for more guidance. Canadian Medical Supplies seems to be the most consistent and reputed on CJM. I got mine from Peptides Canada Direct. Hey Trevor, from what I’ve read its generally advised not to use mixed products. You’d be better of buying both individually especially considering the significant difference in dosage requirements between the 2 peptides. If you did try the mixed vial, how were your experiences with it? I would really like to know. Does this peptide contain alpha Lipoic acid ? How will TB500 do for a pinched nerve between the c6 and c7….I’ve been using BPC for the last 6 weeks for this injury and it hasn’t don’t much. Hey , I am just coming back from nerve damage in c6 and c7 and was wondering if this product could help with my recovery. Any help or feedback would be helpful. Could you.please tell me the dosage for an oral I take of tb500? Yes, you can totally combine both at the same time. It works well. In the same location. Stay tuned for spilanthes info! Great info Ben! Can TB 500 help for torn fascia that has detached to some extent over several years? I am not a doctor, and I haven't seen the extent of your injuries. With that being said, I’d put my money on TB/BPC being able to aid in the healing of any muscle adhesions with the miracles I've seen them work. These are just my own personal thoughts and not a prescription or a diagnosis or any form of health care whatsoever. What if you don’t have any injuries? Is this something you’d recommend for basic maintenance? I’m big on preventative proactive therapies. I appreciate your thoughts. I’m sorry, I need it spelled out and the maths keeps confusing me. What’s my dose if i weigh 165 pounds and i have 1 5mg unconstituted TB500 & 1 3ml bottle of BCW? I have a .3mL needle for dosing & a 3ml syringe for drawing up the water. Are units and stick marks the same thing? Someone help me work it out. please! Brother, you are WAY over thinking it. If a 200 pound man may take 5 mg x 2 week..
Then just to be safe, only use 5 mg a week until you get a feel for it. If I had zero guidance at all, I’d probably use 2.5 a week. Hi, I’ve got a similar question on dosing for TB-500. i weigh 165 pounds and i have 1 5mg unconstituted TB500 & 1 3ml bottle of BCW? I just worked out my dosing of 250mcg of BPC-157 which equals 15 units on my 1mL syringe. Now I’m trying to figure out how many units of TP-500 to use if I’m shooting for 2.5mg x twice a week. I think that equates to 1.5 full syringes. Is that right? I have the same question Ryan. Someone please respond. Ryan is saying 2.5mg of TB 500 is 1.5 ml? Seems like a lot. If true, would it be better to do smaller injections daily? Thanks! Is it 3ml of Bacteriostatic H20 per each 5mg vial of BP-50 to reconstitute, just as it is for BPC-157? Ben, are you sticking to nord-sci still? The site is registered 8/21/2017. Yes, and you can still use BGF20 for 20% off select products. Ben, are you still sticking to nosrd-sci.com? The domain was created 21 Aug 2017, your post is older. Hello, from Portugal here…Today i bougth TB500. After 7 years suffering with pain,left gluteus(top), adductors (Pubic Insercion), i don’t have a exactly diagnosis, after many doctores one orthopedist/surgeon detected “femoral conflict”. I decided 2 months ago to go to a hip arthroscopy. I expected that this could solve all my problems but still recovering and still with the same pain. So i decided to move forward.I heard about TB500. Could this peptide help me ? Here i payed 260€ (304,67 USD) for one box (10 doses 2MG each). How much boxes shoukd i take to have a correct evaluation if it’s working or not ? Hi Ben, what is the recommended dosage/usage of tb 500? You can find dosage information in the above article. If you prefer a more direct, customized approach, I'd be happy to help you via a personal one-on-one consult. Just go to https://bengreenfieldfitness.com/coaching. and then choose a 20 or 60-minute consult, whichever you'd prefer. I can schedule ASAP after you get that. I am a dentist and this is my professional opinion. There is absolutely nothing, and I mean nothing on the market that can “regrow” your teeth. Would bpc 157 and or tb500 help my pinched nerve? I have 2 herniations in my neck and the nerve is pinched between c6 and c7. How would these supplements stop the pain and regain strength in my right side as my strength is the gym is demoralized at the moment. Hey Ben how are ya? I have a pinched nerve between my c6 and c7. Would the bpc157 and/or tb500 help this? Would it just relieve the pain or would it remove it from being a pinched nerve to back in place? Would I regain feeling in my right side and regain all of the strength on lost on my right side due to this injury? did you have any issues with itchy rashes after using it? I’m breaking out like crazy. isit possible to use acetic acid water to mix TB500 or PBC157? I wouldn't. Can't vouch for that water…only sterile bacteriostatic. How stupid would it be to try and take this stuff in my suitcase from the UK to the US? Since it is not illegal to buy and own it, would I be ok? Or am I setting myself up for unnecessary problems? Have you heard of any improvements to spinal disc hydration levels through using TB-500 or BPC-157? So for a dehydrated and bulging but not burst disc to gain height through stimulated repair through peptide use? Hi Joe I have the same shoulder replacement in 1 week I am going to bpc150 and tb500 into the back of the shoulder did you have any success with this and recovering quicker? Any advise would.be massively appreciated. You think bpc 157 and tb 500 would show up on a employee drug screen? What drug would they show up as? im curious to know. To my knowledge a 10 panel test is not going to show peptides. At the end of the day a peptide is nothing more than a complex amino sequence. So I would be VERY confident in saying – absolutely not. Did this end up helping your Levaquin Toxicity recovery Kimberly? Kimberly, fellow floxie here. Did you end up using bpc157 or tb500 or both? Thinking about starting this as well to stop all the tendon issues from cipro. Just to be clear, you’re saying a standard dose for 200 lb. person would be 7.66mg, which is a little more than one 5mg bottle a week, correct? Also, did you use tb500 for yourself? If so, when did you see results? Which did you like better, the tb or the bpc? No, but i have used BPC-157. TB is more powerful. And you are approximately correct on dosage, yes. Hey All, it seems the BPC-157 and AOD-9604 is a very effective and Safe combo…. So I’m still dumb 5mg vial will get you how many doses when reconstituted with 2.5 ml of bac water? If you’re 200lbs or more…it wouldn’t even give you a full dose for that week. Thanks for sharing this experience. I am glad you were able to find something that worked. Lenora can you please tell me what source you used for the peptides? thank you! What does did you use? What was your dose frequency? John why do you say beware? Thymosin beta4 regulates migration of colon cancer cells by a pathway involving interaction with Ku80. These results suggest that Tβ4 is an important regulator of the ILK/AKT/β-catenin/Integrin signaling cascade to induce cell invasion and migration in colorectal cancer cells, and is a potential target for cancer treatment. What that means is that they want to suppress Thymosin Beta 4 in order to treat the cancer. If u had a flexor tendonitis in your finger… What would u use? TB 500 or Bpc 157? I’d stack the regime because I feel they both pose significant benefits! Hi Ben, great article!!. I have wrist tendinitis and can’t lift anymore it’s driving me crazy. For TB 500 what method of use do you recommend? Intervenes etc. Which out of BP157 or TB500 (or a combination of both) would you think would be better for a case of De Quervain’s thumb tenosynovitis? I think the combination of both would be the ultimate approach. Tailor Made compounding pharmacy is the pharmacy that we use in our clinic. One of the few that produces medical grade. I wonder if this would be effective if applied transdermally. ie. in my case, applied to skin in the vicinity of an old and troublesome shoulder injury. Do you think it’s a good idea to use both TB500 and BPC–157 at the same time. Also do you have any idea of TB500’s half life? Do you have any questions I can help you with? Would TB-500 help in healing peripheral nerves that have been injured for many years? I have a 6-year old ulnar nerve injury which has barely healed since the initial injury. Thanks. I am not a doctor and nothing I say should be taken as medical advice. Please talk to a licensed physician about this. There is plenty of evidence that this can be used to help the nerves, yes. Timing doesn't seem to be that important as the half-life in the bloodstream is pretty long. Post workout is when a lot of people do this. If you read through this article, you'll find all your answers! Should I be using this along with some Curcumin and hot/cold baths? Not necessary as it can blunt hormetic response! I am thinking about adding IBF to the regime. I also visit the Chiropactor weekly, Cryotherapy daily, and started Structural Integration today. Do you think Cryotherapy is restricting my cell growth? It has really helped with managing the inflammation that builds up in my shoulder every day. Hi I would advise a ferritin blood test and check other anemia markers as well. When taking BPC or TB orally what in erase in dosage is required to equal your protocol for injection. How many my per week/day. Hey Fred, you'll find all the dosing info here: https://bengreenfieldfitness.com/2016/05/how-to-u… let me know if you have any further questions. why would you take a peptide orally? It’ll be digested, that’s why you need to inject. If using TB for 4-6 months to help healing of an injury. How long will it be before being able to test clean in a blood test. Thanks. I have orderet BPC157 and Thymosin ß4 (peptides warehouse) in order to hopefully help a painful knee. It’s mcl related, and quads, calfs that are too tight… But it is something muscular or tendons… I’m planning on dosing BPC @ 500mcg/day and TB4 @ 2 x 2mg/week… You think this is a good setup? That looks like a pretty good setup to me. I’ve had several back surgeries. I have cages and screws in my back. Which of these would help the recovery of my coresume and lower back? BPC 157 or TB 500? Hi Ben.. I have an old hip fracture that went un noticed.. which lead to osteoarthritis.. hip impingement and a laberal tear.. also have wear and tear on my left hand, 3rd metacarpol is painful and weak.. seems like my tendon is not in line..
Can I inject TB500 into my damaged hand ? I bought this TB 500 but it says it’s 44 amino acids? Is there a difference? Link below. I will only vouch for the TB-500 I talk about in the article above. It is the stuff that I've actually vetted. Can I take TB-500 , with vielight 810? A subcutaneous injection near the injury site may work. Whats the half-life of it? How long after is it detectable in urine and blood? Yes, but it's going to be more effective if injected. I read your comment regarding concussion symptoms and wanted to offer something that you may want to research further. I am simply offering this as an area of research that you may find of interest. Hi Ben, so how much time do I have to use up a vial of tb 500? How many days if I keep it refrigerated? Thanks! Most research shows TB-500 to stay good unrefrigerated for month or two if not reconstituted. Once reconstituted, it should be refrigerated and used within one week. That is the primary reason this stuff comes in such low dosages (e.g. 5mg for an average one week of dosing and 2 mg for an average maintenance dose). Hi Ben, so in your non-medical opinion, which is better ( bpc 157 or tb 500) for reducing inflammation in the joints? I’m considering taking it orally, 250mcg daily for 30 days. Thanks for your feedback. It's all in the article, it's the same formula. I am not a doctor, so this is not to be construed as medical advice. It's worth a shot as there have been cases of it helping to repair cartlidge. Can I combine BPC157 and TB500 in the same syringe? I scanned through and didn’t see this question. Sorry if I missed it. Hey Jerry, I am not a doctor and nothing I say should be taken as medical advice. If it were me yes, I would try it. More fat loss/muscle gain benefits IMO. I am not a doctor and nothing I say should be taken as medical advice. If it were me, I would try TB500, and to inject simply get as close to the injury site as possible. If you want to go into detail feel free to book a consult at <a href="https://greenfieldfitnesssystems.com/ben” target=”_blank”>www.greenfieldfitnesssystems.com/ben and choose 20 or 60 minutes and we'll get you scheduled for a Skype consult. Wondering which would be more affective for ligament and tendon tears TB500 or BP175 I’m currently dealing with a Scapholunate ligament tear. I am not a doctor and nothing I say should be taken as medical advice. I would go for TB500 as long as you know its a banned substance. I notice unlike BPC-157, TB-500 usually doesn’t list ligaments/tendons in the list of benefits (you only mention reducing tendon inflammation). Would it be accurate to say BPC-157 is better for joints/ligaments/tendon/cartilage while TB-500 is better for more vascular muscles/skin/etc? I’m curious why you say TB-500 is stronger, the studies showing BPC-157 healing severed ligaments/tendons seems way more radical and impressive than TB-500’s merely lowering tendon inflammation, and for most people connective tissue injuries are the much more problematic issue. >TB-500 is a synthetic peptide that has been directly linked to impressive extremely enhanced recovery times for muscle and more. It plays a vital role in building new blood vessels, new muscle tissue fibers, new cell migration and new blood cell reproduction. That's an accurate approximation, yep. Finally, I'd be happy to help you via a personal one-on-one consult. Just go to https://bengreenfieldfitness.com/coaching. and then choose a 20 or 60 minute consult, whichever you'd prefer. I can schedule ASAP after you get that. Ben, what about using this or bpc 157 for the SI joint? Mine has been acting up for years. A lot if cracking and popping. It’s definitely a weak link. But it just seems like a scarey spot to go IM. If I were you, for the SI joint I would do this exact program: http://www.RunWithNoPain.com – that's why i wrote it! Hey Ben! Thank you for all of your awesome content. I am wondering if you are familiar with Medivet Equine’s TB-1000 which they market to be twice as concentrated and potent as TB-500? I can find no clinical research to support this claim, and am wondering your thoughts/opinion. Thanks so much! do you have to take bpc- 500 on a empty stomach ??? or you have to have carbs in your body? Nope, you can take it on full or empty stomach although because it is a gastric peptide, empty stomach may be better. As BPC 157 and TB500 seem to have different mechanisms of actions could it make sense to take them together or are there any contraindications you’re aware of? I would say save your money, take one or the other, and if you HAD to choose and it is legal for your sport, TB-500. Hi Ben, has your post on IGF-1 LR3 & DES been released? Hi Ben what is your advice for how frequent to inject and length of time to trial Thymosin and see results? Hello, I have started taking bpc157 and tb500 last week to help with tendinitis of the patellar and an SI injury. Wasn’t expecting much for the SI but I can say something is definitely working. Both are feeling much better and I’m only just over a week in. Ben, i remember you saying you had sprained your ankle during one of the spartan and you used this as a recovery. How exactly did you inject into the ankle? Subcutaneously around the medial malleolus. Ben, just to make sure I’m understanding the maths correctly and not going crazy on the dose. Based upon the recommended dose of 7.66mg / week, it would be expected to use up 1.5 vials of this stuff per week for a 200 pound person? Alos, based on what you read, do you have any thoughts about how best to do this? One shot once a week or a set number of days apart? I might be a moron but that link above is for BP-157. I think people (and me) are asking about the TB-500 dosing protocol. Dosing protocol for TB-500 is in the article above. I haven't seen actual research on hair growth, but theoretically, this could indeed accelerate capillarization and blood flow! What is the equation you would used to determine how much TB 500 to use per kg? Wondering how many 5ml vials I need to purchase to treat bilateral anterior shoulder pain. What is the equation you would used to determine how much TC 500 to use per kg? Have you had any personal experience or know anyone who has used IGF-1 LR3 & DES? Thank you for all the informative work you share! I have an upcoming post on this one! Stay tuned! Perfect ! Are you able to email me once it is up? I can't sorry! You just need to stay tuned! Ben, how would this be for hip labral tear? I am not a doctor and nothing I say should be taken as medical advice. I would definitely give it a go. Let me know if you have any more questions. Can I take TB500 with SARMS? If so, which stack would you recommend for lean muscle and strength? I also have some tendon pain on the inside of my elbow, thinking TB500 could help. Is it possible to take TB500 oral as BC-157 (oral bioavailability)? Yep, same as BPC you can take it orally and it will work systemically. Hi Ben and thanks for all the great information! Just wondering if you see any reason that I shouldn’t start a TB500 cycle almost immediately after a BPC157 cycle. It’s only been a few days after I’ve finished my BPC157 (with some “success”) but I’m anxious to being the TB500. Thoughts? Thanks! You can do it, but I'd recommend taking both at once then cycling off both at once. This is amazing! The use of the TB-500 and Thymosin Beta 4 for humans are limited and it can increase muscle growth, improve endurance and most of all can speed up the healing process of wounds. Essentially, peptides are small proteins that can help to boost the naturally occurring hormones within your body, to help you achieve better results. My wife is an elite athlete who had hip surgery for a torn labrum with impingement. Recovery is super slow and testing is not a current concern… Any suggestions for site and frequency of injection? I am not a doctor and nothing I say should be taken as medical advice. If you have a read through the article, I would suggest following the recommendations there. If you want to go into detail book a consult at <a href="https://greenfieldfitnesssystems.com/ben” target=”_blank”>www.greenfieldfitnesssystems.com/ben and choose 20 or 60 minutes and we'll get you scheduled. There is a site in Australia selling TB-500 reconstituted in 15ml vials. They say to go with 25 units daily for loading. This would mean one month from the same vile. Are you saying that it would be”bad” after 8 days? I can ONLY vouch for the TB-500 source I have listed here (peptides warehouse)…and the loading scheme I recommend above. That is *all* I ill vouch for! Keep any you don't want going bad in the freezer btw. Hey ben , great article. Would combining BPC-157 with TB-500 be same as combining it with MK-677 or any other GH increaser for recovery ? Or is the BPC-157 + TB-500 combo the way to go ? Can you pre-fill syringes with tb500 and put in the freezer until use. Do you have experience freezing this peptide and using it later? I heard once tb-500 has been reconstituted, you have to use it up in 8 days before it goes bad! Theoretically yes, but you do need to use relatively quickly after reconstitution so if it were me I'd reconstitute "fresh" batch. Is there any reason you didn’t list Blue Sky Peptides with your sources for this one? Wondering if you discovered something about quality since the previous BP-157 post. I'm pretty sure you can get this from blue sky peptides too but I didn't check there. Their peptides are good though. Ok Ben ordered the stuff as you suggested. 3 bottles. Going to give it a shot on my elbows which have a bit of tendinitis from doing lots of ring and bar work. Do I try and inject it right into the tendon? Also strained my back a bit would this work for that as well? Inject it into the lower back muscle? Any advice would be aprciated. I do believe you used it on your elbow tendinitis as well so I would be interested on your take of how to do the injections there. For the elbow – subcutaneously, exactly over the area of pain. Pinch the skin and inject away. Best to book a consult for the rest of the questions and we'll go over it there. <a href="https://greenfieldfitnesssystems.com/ben” target=”_blank”>www.greenfieldfitnesssystems.com/ben and choose 20 or 60 minutes. Should I use TB-500 or BPC-157 for an Achilles. I recently tore it and was wondering if any of these products could speed up my recovery? Either would work but if you're not competing in sanctioned sports then TB500 is more powerful. Peptides seem different than anabolics /hgh in the fact that (i’m asking) they don’t shut down or disregulate any of your bodies natural productions /processes or make you feel “weak” it different after stopping them correct? I’ve recently been diagnosed with osteoarthritis in my right knee, with significant cartilage damage. Would either TB-500 or BPC-157 be worth trying in this situation? I am not a doctor and nothing I say should be taken as medical advice, and yes it's worth trying. I have an upcoming surgery and their will be a very long incision basically from my knee to ankle on both legs. Do you feel this would help with healing the would and potential scar tissue. Is TB 500 or BPC a better choice or both?? Honestly either could work. I am not a doctor and nothing I say should be taken as medical advice. TB-500 is probably a bit more powerful. Does this peptide also help heal leaky gut like BPC-157? Would TB-500 or BPC-157 be helpful for broken bones with poor vascularity? The above references demonstrate a relationship to cancer. Can you please provide references that substantiate your position that TB-500 presented with CA is not contributory. Many thanks. And drinking soy increases your risk of endometrial hyperplasia. The same arguments are seen with insulin, insulin growth factor (IGF), HGH, and anything that increases over expression and up regulation of androgenic receptors. The research goes back and forth. I highly suspect that in a case of mitochondrial integrity – such as discussed in my recent podcast with Dr. David Minkoff on what really causes cancer – it is a nonissue. But that is just a hypothesis. If you are racing Spartans you can't take TB-500. So there's your answer! BPC-157 better choice for you I think if you are racing. hi..had three torn muscles between shoulder and bicep..all needed surgery for re attachment.. did a 20 day round of 157.. believed it helped..looking for a suggestion..another round or do you think the TB500 may be better? im at 7weeks of a 6-8month healing process. Thank for these articles and any insights-recommendations you may have. Hi Ben, I am interested that you mention one of the effects as reduced inflammation in tendons. Have you come across anything to eliminate Dupuytren’s constricture, which is a disease of tendons in the hand, without surgery? Thanks Ben, that has given me a couple of things to try. Do you think this would be good for a fractured kneecap? I am not a doctor and nothing I say should be taken as medical advice. However, I have seen some studies that show that the anabolic effect may help with bone healing. BPC 157 for healing gut also has a good potential when taking as enema technically . For healing leaky gut etc . So that may be way to try it , should be very potent that way and has been done before. Did you have anny luck shuttint down leaky gut etc with oral administration Ben ? Lactulose / mannitol testing before after ? BLP? Is this helpful for people who have herniated disc?